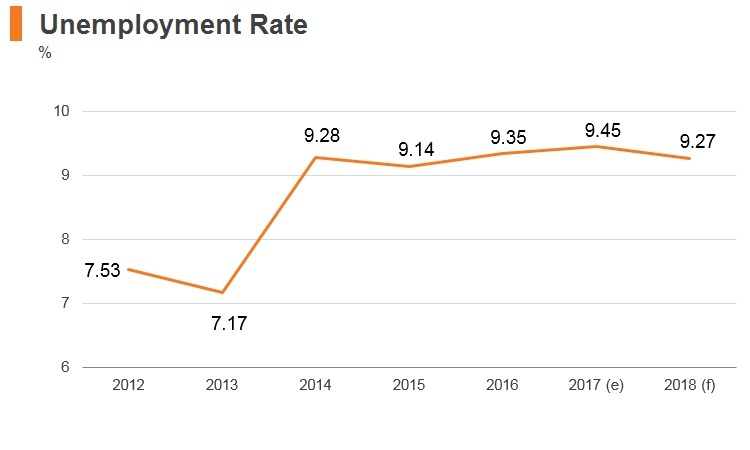 Economic growth in Ukraine remained modest in 2017. The government, which took office in April 2016, has committed to an ambitious and wide-ranging reform agenda that has resulted in significant fiscal consolidation, a move to a flexible exchange rate, reformed energy tariffs, more transparent public procurement, simplification of business regulations, stabilising and restructuring the banking sector, a package of health reform and the establishment of anti-corruption agencies. These reforms will need to be advanced further for Ukraine to achieve a sustainable recovery, a process that the World Bank’s 2017-2021 Country Partnership Framework has been established to support. 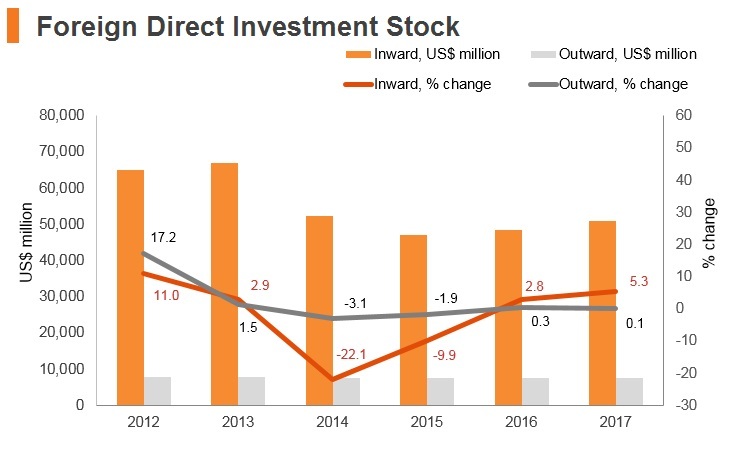 Despite the ongoing security crisis, Ukraine’s proximity to both the European Union (EU) and countries such as Russia and Kazakhstan, its large consumer base and the physical size of the country are key factors that boost its long-term investment attractiveness. The country’s main asset is its extensive human capital: a well-educated workforce provides a competitive advantage. Poverty remains above pre-crisis levels, but declined slightly in 2017 due to the modest economic recovery and wage growth. Russian forces annexed Crimea. Responding to a request from Ukraine’s government, the World Bank announced its support for a reform agenda to put the country’s economy on a path to sustainability. Armed groups in the east of the country seized parts of the Donetsk and Luhansk regions on the border with Russia. Ukraine’s government launched a military operation in response. Leading businessman Petro Poroshenko won the presidential election and signed the long-delayed EU association accord in July. Ukraine’s government signed the Minsk peace plan ceasefire with Russian-backed groups in eastern Ukraine. Parliamentary elections produced a convincing majority for pro-Western parties. In Donetsk and Luhansk pro-Russian groups held elections that were not provided for by the Minsk plan. Ukraine responded by rescinding its pledge for regional autonomy. With the first peace agreement having clearly failed, the leaders of Germany and France brought together presidents Poroshenko and Putin to secure a new ceasefire and peace plan, subsequently known as Minsk II. Ukraine joined the WTO Agreement on Government Procurement, giving Ukrainian companies the right to participate in public procurement of 45 countries, including EU countries, Canada, Hong Kong, Japan, Korea, Singapore, Taiwan and the US. The agreement also requires Ukraine to follow WTO rules for public procurement. The 2017-2021 Country Partnership Framework between the World Bank and Ukraine began, with a focus on creating the conditions for fiscal and financial stability that will enable Ukraine to achieve a lasting economic recovery that benefits the entire population. Ukraine’s association agreement with the European Union was ratified by all signatories, to enter into force on September 1, 2017. Russia’s President Putin opened a bridge linking southern Russia to Crimea. 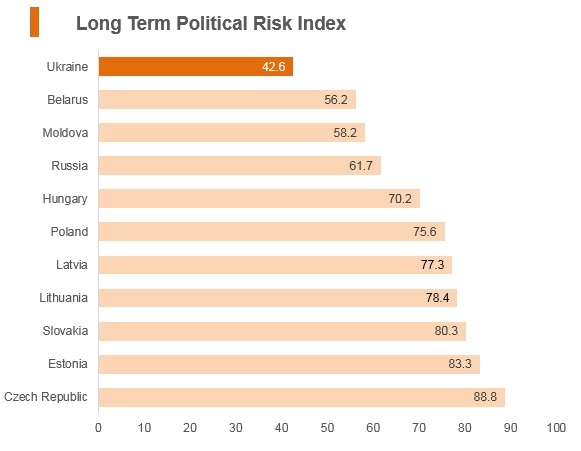 Presidential and parliamentary elections are scheduled, the outcomes of which pose risks to both the economic reform programme and the security situation. Ukraine has been a member of the WTO since May 16, 2008. Trade bureaucracy and customs delays are a significant hindrance to foreign investors. 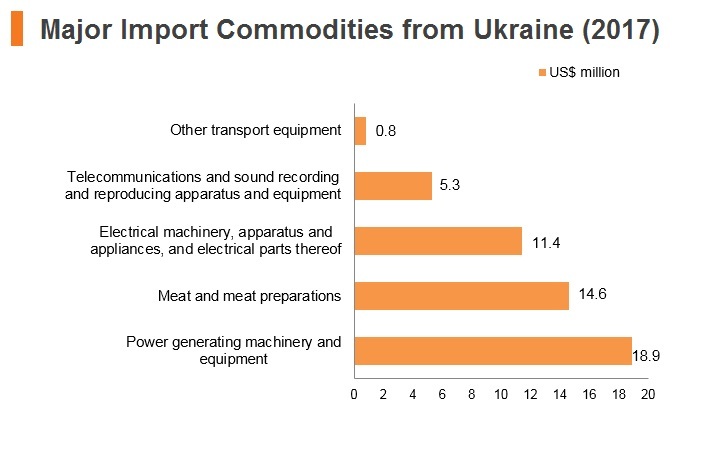 In recent years, Ukraine’s trade flows have benefitted from low tariffs, which have an average rate of 2.1%. The size of import duties is variable and often depends on whether the item being imported is similar to a domestically produced item, in which case the duty is usually higher. Import tariffs range from 2-50%. Excise taxes can be up to 300%, with alcohol, tobacco, petroleum products and automobiles generally subject to higher excise duty. Tariff charges are mostly lifted for trade between members (Russia, Belarus, Uzbekistan, Moldova, Armenia, Kyrgyzstan and Kazakhstan) of the Commonwealth of Independent States (CIS), with which an FTA is in place. In 2015, Ukraine introduced an export ban on pine and unprocessed timber for a period of 10 years. There are export quotas in place for copper slag, ash and residues (waste) containing primarily zinc and raw minerals. There are also licensing requirements for the exports of certain goods containing alloyed ferrous metals, non-ferrous metals and their alloys. 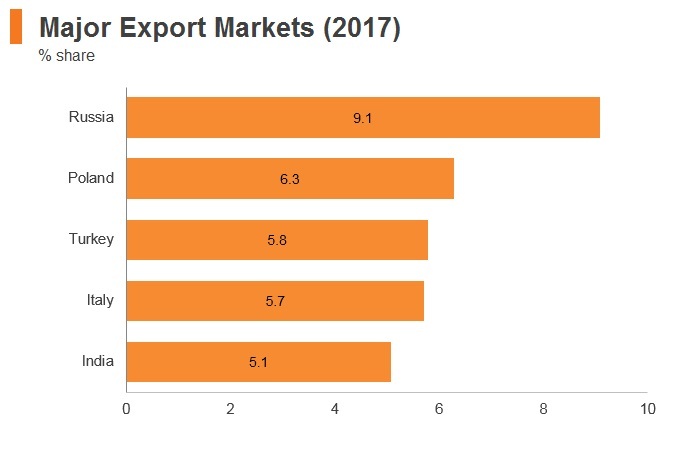 Ukraine replaced export quotas on certain agricultural products with export tariffs (9% but not less than EUR17/tonne for wheat, 14% but not less than EUR23/tonne for barley and 12% but not less than EUR20/ tonne for maize). There are also import licensing requirements with respect to insecticides (except veterinary medicinal products), fungicides, herbicides, means to prevent germination and plant growth regulators, rodenticides (except veterinary drugs) and similar means to them (except disinfectants). The Ukraine has imposed various anti-dumping measures on a wide range of products, predominantly in the areas of textiles, vehicles, steel, some electrical goods, wood-fibre boards, and machinery on goods coming from Russia, China and a few other Asian nations to protect domestic industries. In November 2015, the Ukrainian authorities imposed a definitive countervailing duty on imports of cars from Russia. The rate of duty imposed is between 10.4% and 17.66%, depending on the company. The duty is in force from January 2016 for a period of five years. Ukrainian exports have been hurt by Russia’s ban on imports of dairy, chocolate, fruits and vegetables, which has contributed to Russia having fallen behind the EU as Ukraine’s largest export destination in recent years. Armenia-Ukraine: This agreement became effective in December 1996. Ukraine’s exports to Armenia include meat, dairy products, vegetables and cereals. Armenia’s exports to Ukraine include electro-technical products, alcoholic beverages and mineral waters. Azerbaijan-Ukraine: This agreement became effective in September 2006. 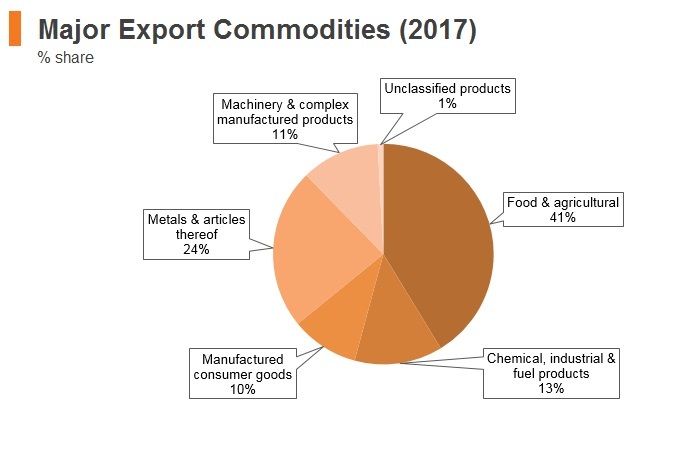 The goods imported by Ukraine from Azerbaijan are mainly metallurgy products, machine building products, agro-industrial products and chemical industry products. 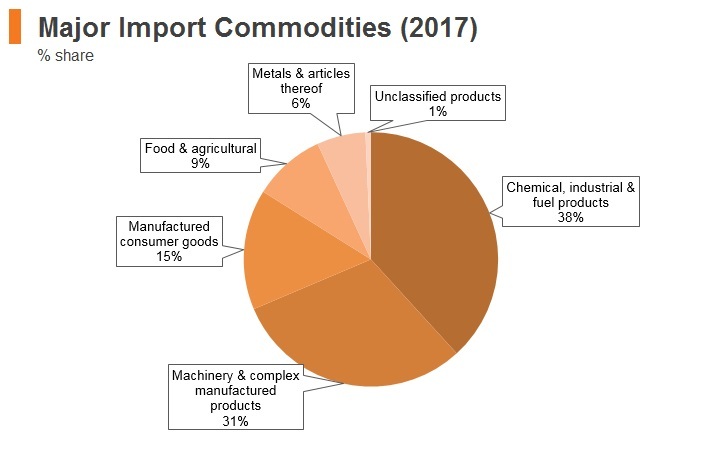 The main goods exported from Azerbaijan to Ukraine are generally products of the fuel energy industry, chemical industry products, and agro-industrial products. 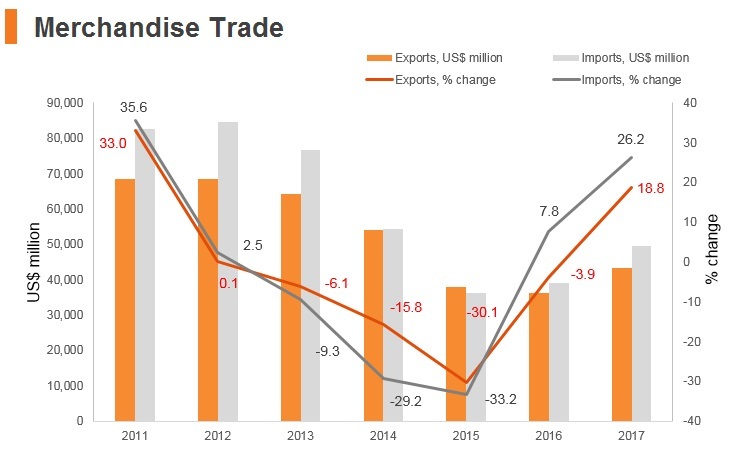 The trade turnover between the two countries amounted to USD810 million in 2017. Georgia-Ukraine: This agreement became effective in June 1996. 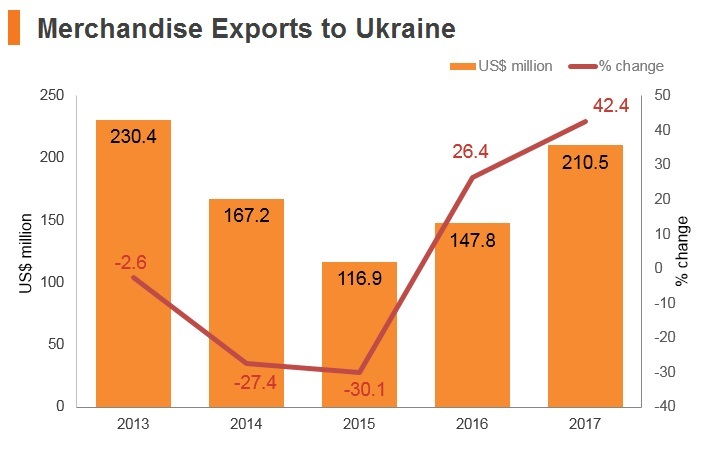 The trade turnover between Georgia and Ukraine reached USD500 million in 2016. Georgia, Ukraine, Azerbaijan, Moldova (GUAM) Free Trade Agreement: This agreement has been in effect since May 2006. The volume of trade in goods and services between Ukraine and the GUAM member countries amounted to USD1.7 billion in 2016. Kazakhstan-Ukraine: This agreement became effective in October 2008. Ukraine’s exports to Kazakhstan consist mainly of machinery, mechanical appliances, some cooking products and dairy produce. 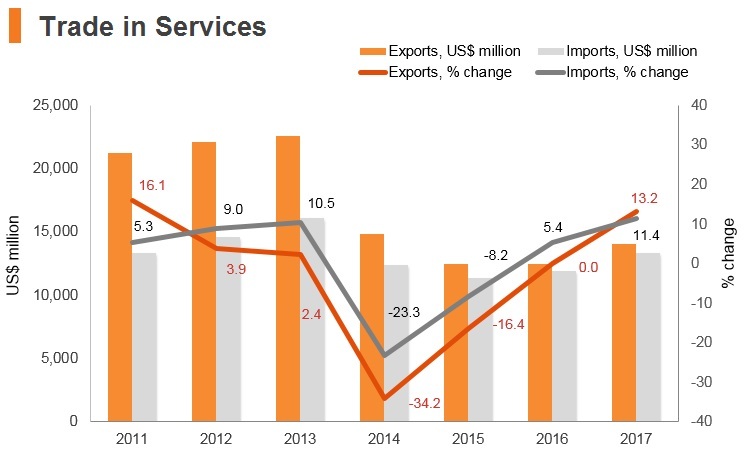 Kazakhstan’s exports to Ukraine consist of mineral fuels, mineral oils and products of their distillation, zinc and articles thereof, iron and steel as well as fertilisers. Kyrgyzstan-Ukraine: This agreement became effective in January 1998. Ukraine’s exports to Kyrgyzstan include pharmaceutical products, machinery, sugar and sugar confectionery, and cocoa. Kyrgyzstan’s exports to Ukraine consist of raw hides and skins, mechanical appliances, electrical machinery and equipment, as well as glass. Tajikistan-Ukraine: This agreement became effective in July 2002. The main items Ukraine exports to Tajikistan are sugar and sugar confectionery, cocoa and products thereof, paper and cardboard, and pharmaceutical products. Tajikistan’s exports to the Ukraine consist mainly of fruits and nuts. Turkmenistan-Ukraine: This agreement became effective in November 1995. The main items Ukraine exports to Turkmenistan are sugar, dairy produce, cocoa and cocoa preparations, and articles of iron and steel. Turkmenistan’s exports to the Ukraine consist mainly of mineral fuels, mineral oils and products of their distillation, plastics and articles thereof, cotton and machinery. Uzbekistan-Ukraine: This agreement became effective in January 2006. 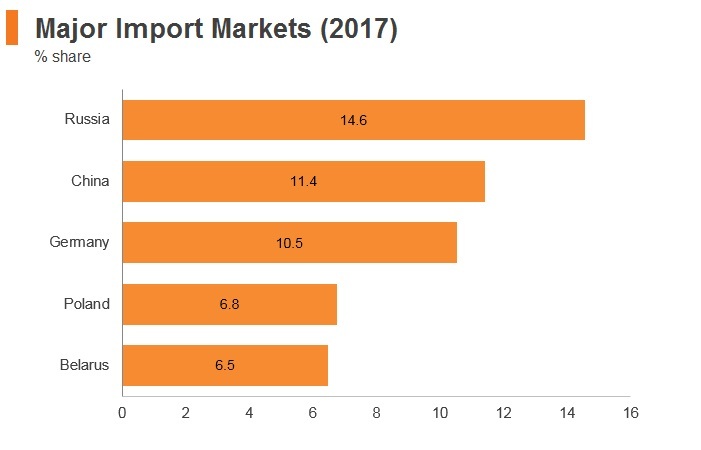 Uzbekistan’s imports from Ukraine mainly consist of iron and steel, the products of the light and chemical industries, as well as agricultural products. Uzbekistan supplies to Ukraine various types of engineering products, chemical products, pharmaceuticals and agricultural products. CIS Free Trade Area: Coming into effect in September 2012, this agreement created a trade area between Russia, Ukraine, Belarus, Uzbekistan, Moldova, Armenia, Kyrgyzstan, Azerbaijan, Turkmenistan, Tajikistan and Kazakhstan. CIS states remain key trade partners, but Russia has suspended the application of the FTA for bilateral trade with Ukraine, meaning that barriers have been raised with the country’s largest trade partner. European Free Trade Association (EFTA)-Ukraine Free Trade Agreement: Signed in June 2010, this comprehensive free trade agreement with the four member countries (Iceland, Liechtenstein, Norway and Switzerland) of EFTA entered into force in June 2012 and includes trade in goods (industrial and processed agricultural goods, fish and other marine products), trade in services, investment, protection of intellectual property rights, government procurement and provisions on competition. Bilateral arrangements on agricultural products between the individual EFTA states and Ukraine also form part of the instruments establishing the free trade area between both sides. 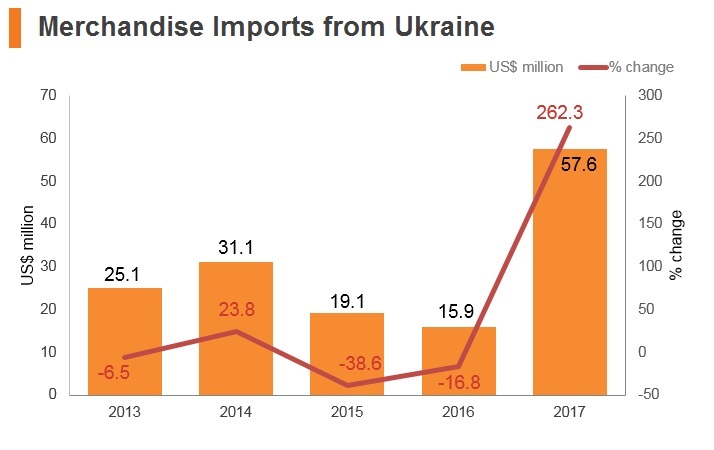 Canada-Ukraine: Upon the agreement’s entry into force in August 2017, Ukraine eliminated tariffs on approximately 86% of its recent imports from Canada, with the balance of tariff concessions to be implemented over periods of up to seven years. This includes elimination of tariffs on all Canadian exports of manufactured goods, fish and seafood, and the elimination of the vast majority of Ukraine’s agricultural tariffs. 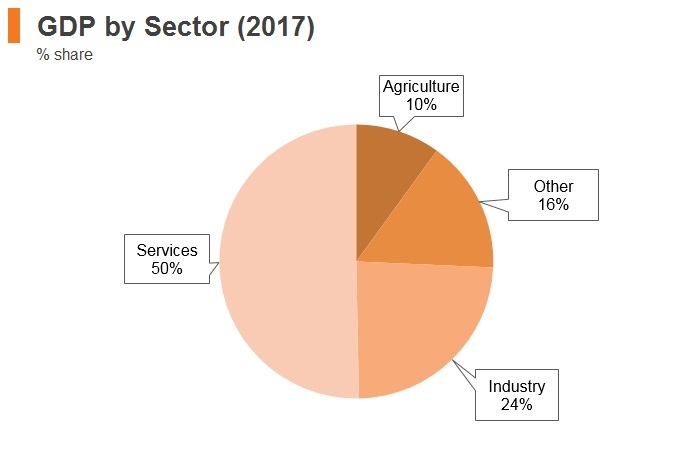 Key product areas benefitting from either immediate or eventual duty-free access include beef, pulses, grains, canola oil, processed foods, animal feed, frozen fish, caviar, certain articles of iron and steel, industrial machinery, plastic products and cosmetics. Tariffs will also be eliminated on fresh and chilled pork, while frozen pork as well as certain pork offal and fat will benefit from an annual duty-free tariff rate quota that exceeds current exports by a large margin. Canada will eliminate tariffs on 99.9% of imports from Ukraine. This includes elimination of tariffs on all manufactured goods, fish and seafood, and 99.9% of agricultural imports into Canada from Ukraine. Key products from Ukraine that will benefit from this duty-free access include sunflower oil, sugar and chocolate confectionery, baked goods, vodka, iron and steel, apparel, ceramics and minerals. The trade flows currently are not high, but the agreement will facilitate greater trade. EU-Deep and Comprehensive Free Trade Agreement (DCFTA): This agreement established a free trade area between the European Union and Ukraine. A DCFTA is part of each country’s EU Association Agreement, and this particular one allows Ukraine access to the European Single Market in selected sectors and grants EU investors in those sectors the same regulatory environment in the associated country as in the EU. The agreement with Ukraine was provisionally applied since January 1, 2016, and formally entered into force on September 1, 2017. Ukraine exports to the EU are raw materials (iron, steel, mining products, agricultural products), chemical products and machinery. 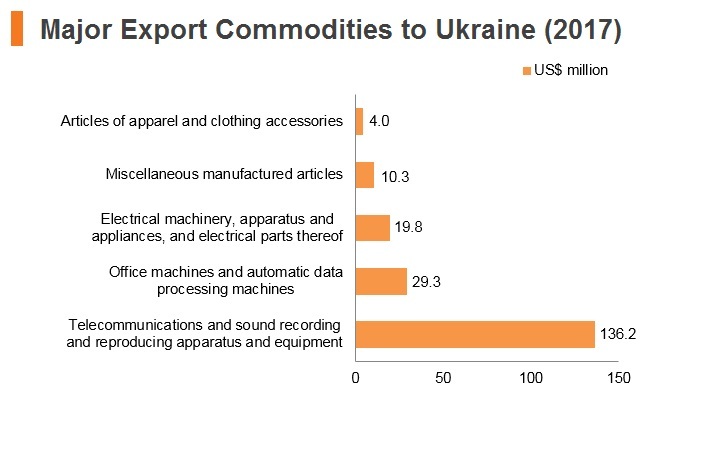 The main EU exports to Ukraine include machinery and transport equipment, chemicals and manufactured goods. Ukraine is currently discussing bilateral free trade agreements with Turkey and Israel. Foreign companies are restricted from owning agricultural land, manufacturing rockets, producing bio-ethanol, and some publishing activities. 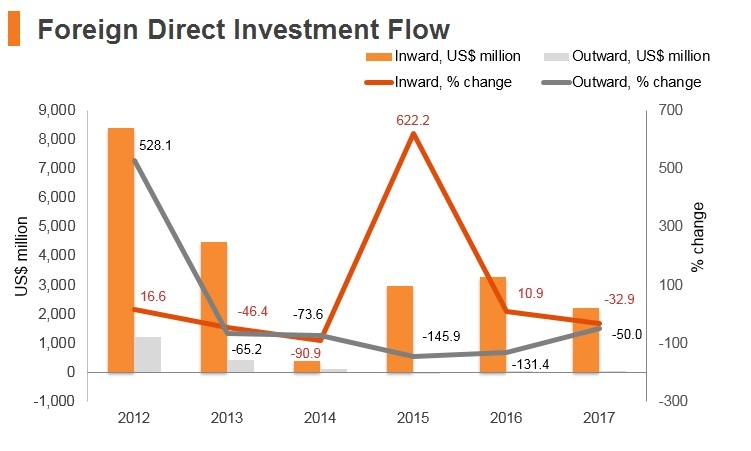 The presence of state-owned, often heavily subsidised, enterprises in many areas of the economy, particularly energy and mining, is also a deterrent to foreign involvement in those sectors. There are local content requirements in wind, solar and biomass power plants, certified as completely built-up and compliant with building regulations after July 1, 2013. In addition, Ukrainian law authorises the government to set limits on foreign participation in strategically important areas. In 2013, Ukraine prohibited foreign ownership of media. Previously, there was also a moratorium on agricultural land sales to foreign investors (which remained in effect until January 2018). Reforming agriculture and enhancing the efficiency of this essential sector has to be a key pillar of the structural reforms needed to enable Ukraine’s economy to perform to its full potential. Agricultural yields of core crops are behind those of international competitors. Ukraine has bilateral investment treaties (BITs) in force with more than 50 countries or economic unions, such as BLEU (Belgium-Luxembourg Economic Union). It has signed a further 16 BITs that have not yet come into force, and is in negotiations with Algeria over another. Ukraine signed a Trade and Investment Cooperation Agreement with the US in April 2008. The agreement established a joint council on trade and investment, which addresses a wide range of related issue including market access, intellectual propery, labour and environmental laws. 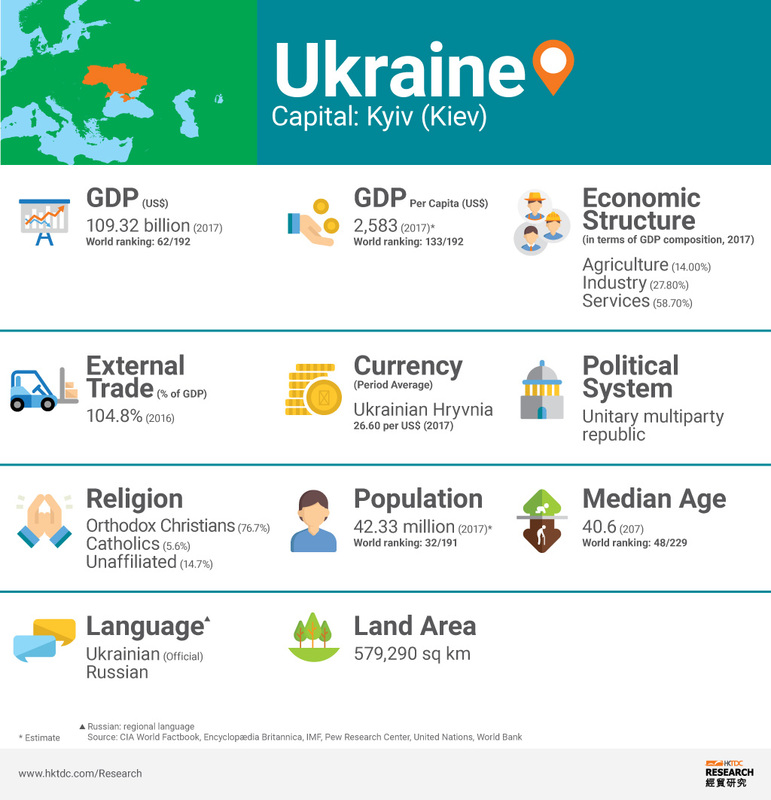 Ukraine does not maintain special or free economic zones (SEZs or FEZs) - Ukraine offers generous depreciation rates for most fixed assets, including property, plant and equipment for both foreign and domestic investors. - Until 2021, newly established taxpayers can benefit from ‘tax holidays’ as long as they have an annual income of UAH3.0 million or less and meet a series of additional requirements. These include a payroll featuring at least two statutory minimum wages per employee and involvement in a priority area of the economy that the Ukrainian government is looking to incentivise, such as the export of IT products and services. - Foreign investors are exempt from customs duties for any in-kind contribution imported into Ukraine for the company’s charter fund. The limit on the deductibility of loan loss provisions (LLPs) for banks and other financial institutions is abolished. The LLP amounts that were not deducted as of December 31, 2017 due to the limitations in the Tax Code effective in the past periods (so-called 'overlimit') are fully deductible in 2018 and 2019 (in equal parts). Transactions performed between a non-resident and its permanent establishment (ie, commercial representative office) in Ukraine are now considered controlled for transfer pricing purposes if their value exceeds UAH10 million (net of indirect taxes) for the corresponding tax (reporting) year. Temporarily until December 31, 2018, the imports and local supplies of vehicles with electric engines are exempt from value added tax (VAT) and excise tax. In 2018, the specific excise tax rate for all types of tobacco products, cigarettes, raw tobacco, and tobacco waste, as well as the minimal excise tax on cigarettes, went up by 29.7%. The rate will also grow annually by 20% through to 2025. A work permit is normally issued for the period of employment indicated in the employment contract, but for not more than one year. A work permit can be renewed for the same term, for an unlimited number of times and free of charge. The employer bears the costs of about EUR200 per work permit. Regulations on employment conditions and the access to basic social services are somewhat discriminative against regular migrant workers, and they are basically non-existent for undocumented migrant workers. Foreigners can only be employed in positions for which no suitable candidate could be found domestically or in the region. Work permits are required for employees of a foreign company performing work or services in Ukraine aiming to fulfil contractual obligations of the foreign company vis-à-vis a Ukrainian contractor (provided that not more that 50% of employees engaged in fulfilling this contract are foreign nationals). Citizens of China and Hong Kong, Australia and New Zealand require a visa, but citizens from countries including Armenia, Azerbaijan, Belarus, Georgia, Moldova, Russia and Uzbekistan face no travel restrictions at all. EU citizens and those of Canada, the US, Japan and the EFTA countries can stay for 90 days in any 180-day period. 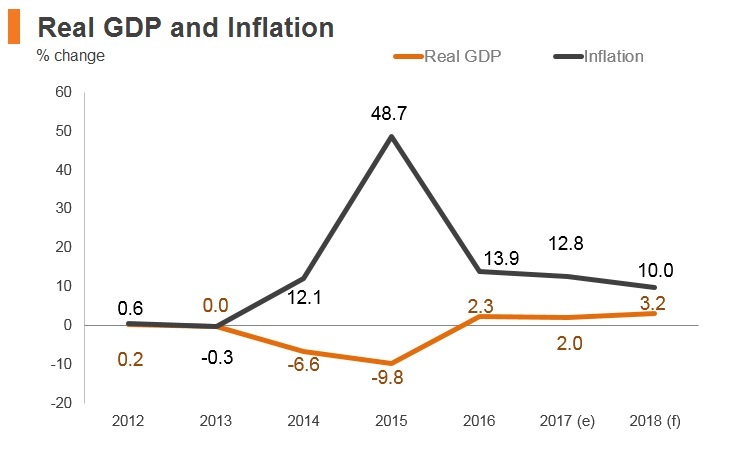 While Ukraine’s economy is gradually recovering from the severe economic contraction in 2015, the economic and political situation remains precarious. 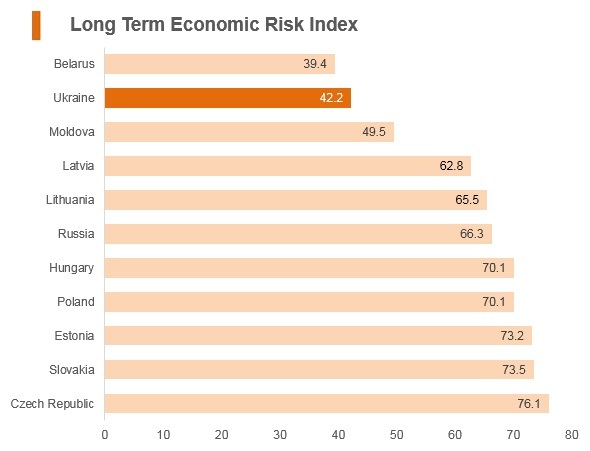 Serious reforms are underway to address the fundamental problems in the Ukrainian economy. While the country has seen inflation gradually cool, the devaluation of the hryvnia has placed severe pressure on households, leaving savings and purchasing power significantly subdued compared to pre-crisis levels. 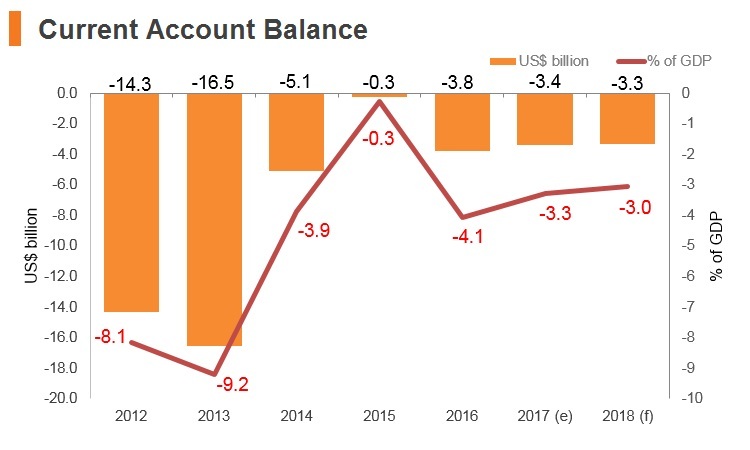 Ukraine also faces high debt servicing costs, while the banking sector has experienced a sharp deterioration in asset quality on its FX loan books. 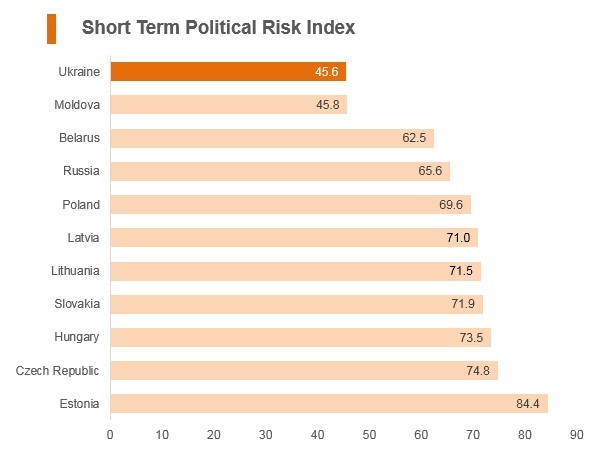 The operating environment in Ukraine has been severely dampened by the weak security situation in the east of the country as well as the accompanying deterioration in trade and diplomatic relations with Russia. However, with the shift in leadership since 2014, some key structural reforms have been undertaken. These reforms include significant fiscal consolidation, moving to a flexible exchange rate, reforming energy tariffs and social assistance packages, making public procurement more transparent, simplifying business regulations and restructuring the banking sector. The country has also moved towards establishing anti-corruption agencies and mandating asset disclosures for public officials. The country’s main assets are its strategic location and extensive human capital. 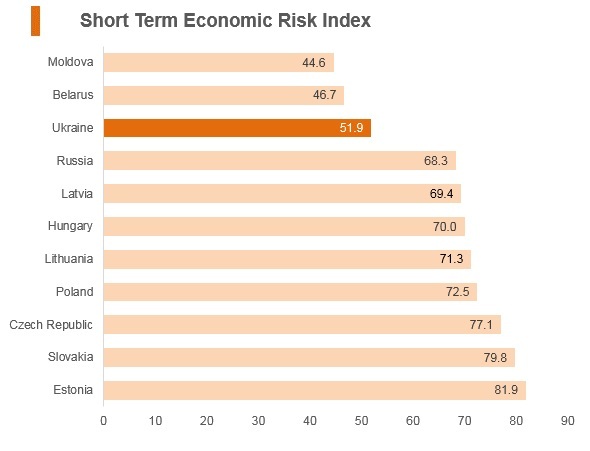 Ukraine’s well-educated workforce provides a significant competitive advantage for firms, particularly if the risk of conflict eases in the quarters ahead. Going forward, Ukraine will need to advance reforms on multiple fronts to achieve sustainable recovery and shared prosperity. Holders of a Hong Kong SAR passport can enter Ukraine without a visa for up to 14 days.